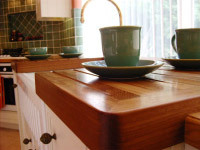 Wood is still the only worktop material that provides a warm, soft and natural finish to most projects. It does require a bit of maintenance and care to keep it looking good. 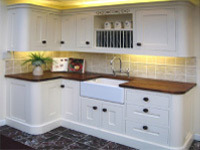 However, if you want that country cottage look and feel, no other worktop achieves it in the way wood does. There is a good selection of colour choices available, some of which produce a slightly more contemporary feel. It can be supplied in different thicknesses and has plenty of edge details to select from, therefore making it easy to personalise its overall effect in your design. 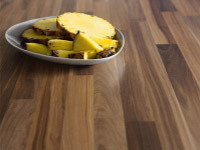 As it has subtle and fairly neutral tones it is often used in conjunction with other worktop materials which have contrasting but practical benefits. For example, it combines well with granite, where granite is used in the hot areas of the kitchen and wood in the seating area or perhaps on a dresser. If designed well this can add another dimension to the overall look and feel of the kitchen. Wood is still one of the most versatile and appreciated materials used throughout most industries today. Hardwoods from managed forests in particular will continue to be an integral part whenever we choose to furnish our homes.